Vegan charity PETA has become a shareholder in boohoo in a bid to persuade the fashion giant to ditch wool. Earlier this year, boohoo said it would stop selling clothing and items made from the fabric on ethical grounds, but later U-turned following pressure from the wool industry. Now PETA says it has bought shares in the brand so its representatives can attend the annual general meeting later this year, speak to other shareholders and executives, and 'call for the retailer to commit to finally banning wool'. "It's time boohoo group proved that it's a real leader in global retail by standing by its compassionate initial decision to ban wool," PETA Director of Corporate Projects, Yvonne Taylor, said in a statement sent to Plant Based News. "As a shareholder, PETA US will be able to push the retailer's management to do the responsible thing for shareholders and animals alike by showing that no jumper or scarf is worth kicking, punching, and killing gentle sheep on the shearing floor." The charity adds that since 2014, it has released 11 exposés of 99 wool industry facilities on four continents, including in the UK. "Systemic abuse was found in every one," it said. "On farms across England and Scotland, shearers were found punching sheep in the face, stamping and standing on their heads and necks, and beating them with electric clippers. "Several sheep died of apparent stress during and following shearing, and one farmer was recorded dragging two ailing sheep into a shed, where he left them to suffer and die." 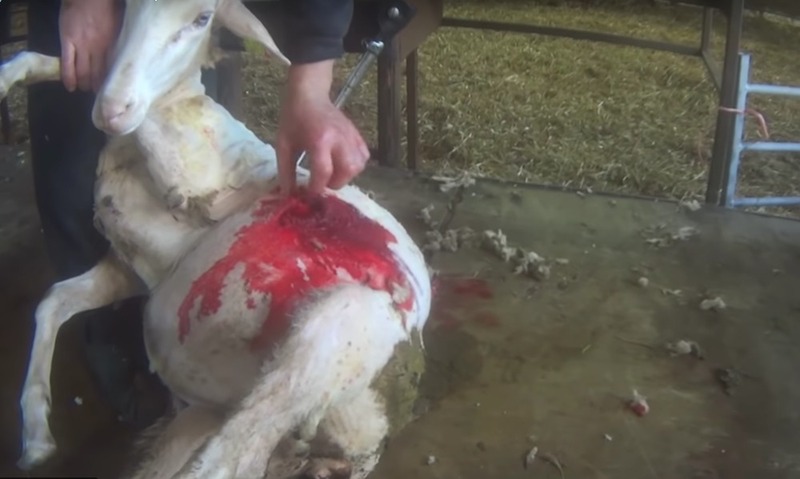 Responding to PETA's UK investigation, British Wool said it was 'shocked and saddened'. "As a farmer-owned organization, British Wool collects and sells the wool on behalf of British farmers," it added. "We are passionate and committed to continuously seeking to improve shearing skills and good practice in the UK. "Every year we train more than 1,000 people in all parts of the UK on two-day training courses that are tailored to their existing level of experience and skill. "We would like to point out that the vast majority of the thousands of shearers in the UK operate to the highest standards of animal welfare, which is an integral part of all our shearing courses."